Breakout is a beautiful, responsive WordPress theme that shows us a little shine and gloss are still very much in. It’s built with the renowned Theme Blvd framework, which includes Twitter Bootstrap, FontAwesome, basic retina support, and exclusive compatibility with our most popular end-user WordPress plugins. Make sure to view the theme’s Live Preview on your various devices and browse through all of the demonstrated features. Whether your website visitors are browsing from a Retina MacBook Pro, a Retina iPad, or any of the other high-resolution devices that inevitably will come onto the market, Breakout has you covered. The theme’s stylesheets automatically check each website visiter’s device pixel-density ratio, and then serve up all of the theme’s details crafted for their specific resolution. The result is a graphically beautiful experience, no matter the device. Our goal is to provide you with the most flexibility as possible with the look of your site, while letting you avoid sifting through an endless abyss of options. You can get a good idea of the stylistic options that come with the theme by looking at the Live Preview. Also, you have full control of typography and link colors, including using any font from the Google Font Directory. When installing Breakout, you’ll be prompted to install some of our most popular plugins to compliment your theme. 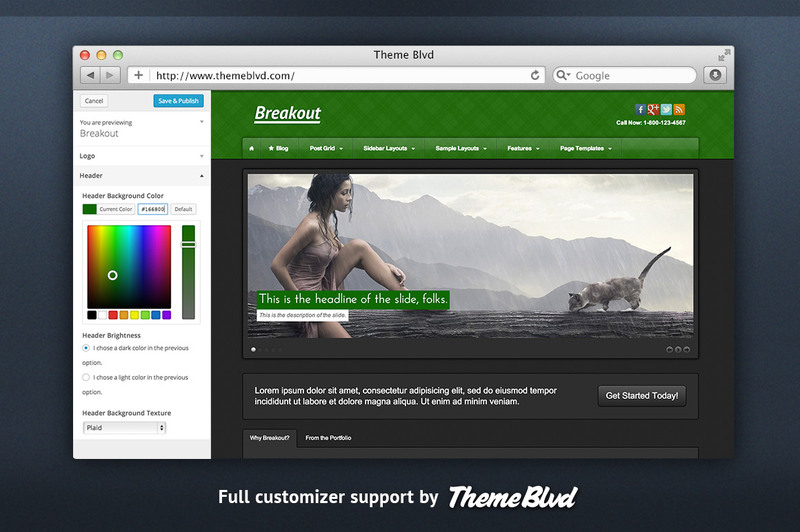 These plugins are free, but will only work with a Theme Blvd theme. Because our theme framework is so flexible, we’ve also got a growing library of other little plugins, that accomplish various other tasks. Go to the Builder page and create a new custom layout. Use “Breakout Homepage” as your layout’s starting point. Configure your element settings, including selecting your custom slider in the slider element, and save the layout. Fixed main menu's home button bug on tablet view. Added support for WordPress 3.5+ media uploader. Added responsive support for self-hosted videos. Added responsive support for self-hosted audio files. Resulting pagination from using <!--nextpage--> is now filtered to output like framework's pagination. Added Twitter Bootstrap 3.1 and FontAwesome 4. Basic HiDPI (i.e. Retina) support added to main layout elements. Tons of responsive improvements for mobile devices and tablets. Improved mobile appearance when responsive design is turned off. Icon-support added to WordPress's menu builder. Styling enhancements for WordPress's "Custom Menu" widget when used in sidebars. 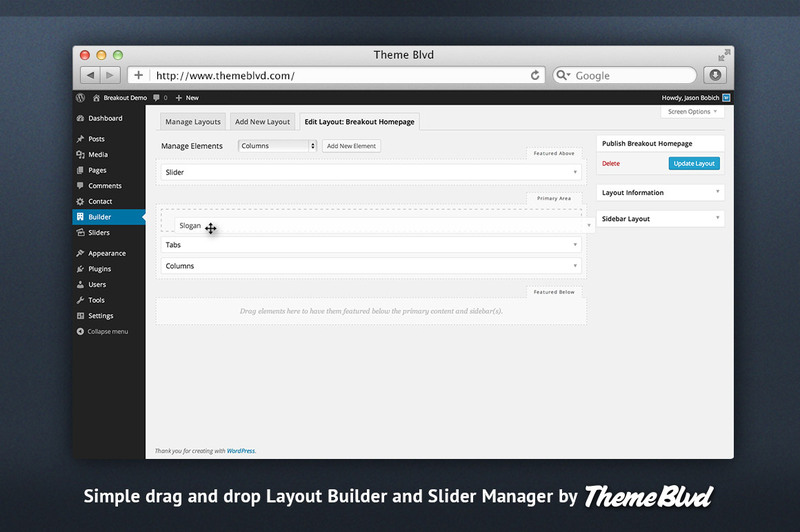 Layout Builder functionality moved to Theme Blvd Layout Builder plugin. Now edit custom layouts directly from the Edit Page screen, in addition to the Builder. Minor UI improvements for managing layouts. Can now edit layout names and ID's after creating them. Slider functionality moved to Theme Blvd Sliders plugin. Bootstrap Carousel slider type added. No more fixed CSS heights on sliders any where. Height limits on slider videos is now controlled when editing a slider. Custom image size selection added. Buttons on full-width image slides removed; use image link instead. Post Slider added, which generates standard slider from a set of posts. Minor UI improvements for managing sliders. Can now edit slider names and ID's after creating them. Sliders now displayed on frontend much more efficiently. Much more extendable for developers. Custom widget area functionality moved to Theme Blvd Widget Areas plugin. Custom conditional support for assigning widget areas added. Can now apply custom sidebars directly while editing pages, if you like. Minor UI improvements for managing widget areas. Widgets moved to Theme Blvd Widget Pack plugin. Twitter widget has been removed; use Tweeple plugin instead. Horizontal menu widget added for collapsible widget areas. Mini Post Grid can now take a standard gallery. 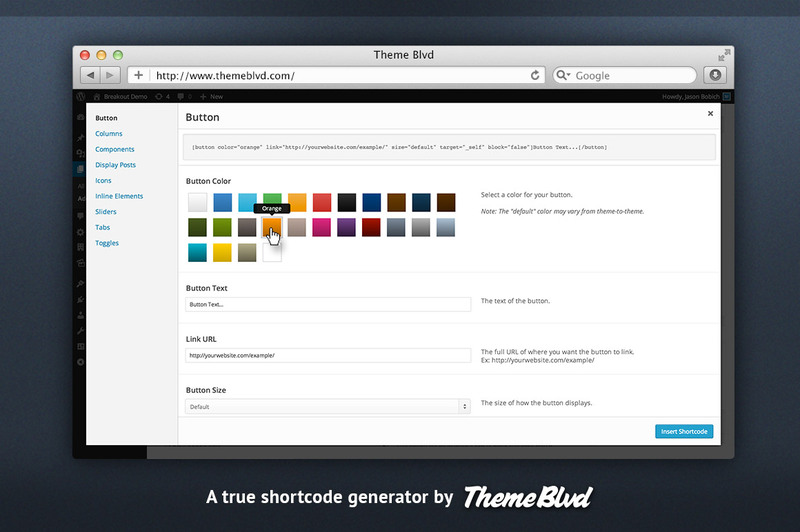 Shortcodes moved to Theme Blvd Shortcodes plugin. Many new shortcodes and enhancements added for Twitter Bootstrap integration. A lot of current shortcodes have changed, but with backward compatibility in mind. The [icon] shortcode now accepts custom icons; simply create an "icons" folder in your Child theme. Default lightbox integration now uses Magnific Popup. Huge improvements to responsive handling. Corresponding setup options added to Appearance > Theme Options > Content > Lightbox. Google map support added for lightbox popups. Get prettyPhoto back by activating the Theme Blvd prettyPhoto plugin (with HiDPI/Retina support added). Added option to select color of social media icons. Added HiDPI (Retina) support for logo option. Removed "Tan" selection from content color option. Removed analytics option (use plugin). Huge framework improvements to the API system, database querying, and performance. Tons of new filters and actions added. CSS files re-arranged for easier Child theme CSS mods; now use style.css. A lot of code re-formatting, commenting and overall cleanup for better organization and readability. Still continuing to grow the developer documentation. dev.themeblvd.com. Fixed bug with customizer clearing social icons saved from Theme Options page. Updated FlexSlider jQuery plugin to v2.0 and made adjustments it's compatible. This shouldn't make any immediate difference in your theme, but will allow us to add functionality in the future. If you're using the Theme Blvd News Scroller widget, make sure to update it! Hooked in new function to WordPress's "pre get posts" action that adjusts the true "posts per page" setting for custom homepage layouts that contain a paginated element. Added frontend locals.php file to API directory. This allows it to be accessed by any 3rd-party plugin that may be trying to access fronted text strings when is_admin is true, for whatever reason. Specifically, this issue was brought about by the AJAX Comment Loading plugin. Fixed bug with localization not working on text strings included within API areas like Theme Options. 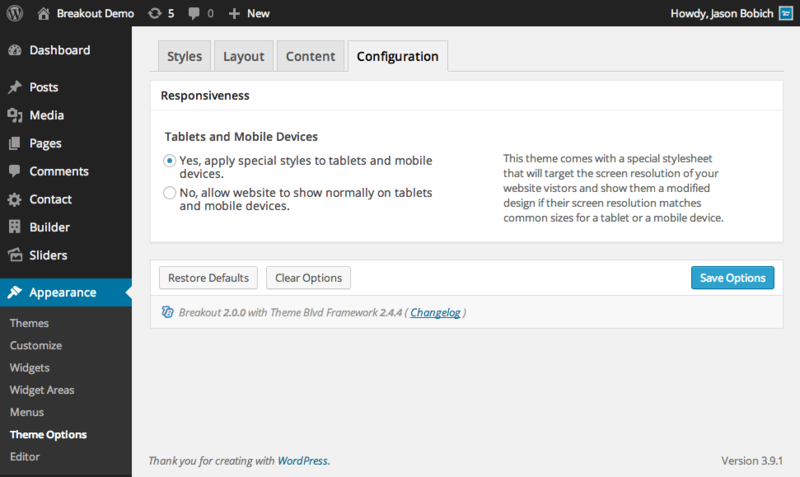 Added compatibility with WordPress 3.4 Customizer. Added optional pause on hover feature to standard slider options. Added alt tags to images in sliders for you SEO folks. Added title as accepted parameter for img tags when saving theme textareas. Fixed Lucida Grande font selection from Theme Options. Removed clear:both; CSS on header tags. Updated all admin modules to work with this tutorial. Fixed pagination for single posts with wp link pages function. Fixed search form to work with WP sites installed in sub-directories different than the site url. Adjusted responsive images for IE8 and below. Fixed PHP warning when saving Content element of the Layout Builder and no floating widgets areas exist. Adjusted slider mobile fallback to display shortcodes in descriptions. Adjusted so when no custom layouts have been created, you won't see any message about custom layouts under "Page Attributes" until you attempt to select the "Custom Layout" page template. Added specific support for WordPress Multisite signup page. Added stripslashes to titles of tabs to allow apostrophes. Styled mobile fallback for sliders to look nicer. Fixed option for header when selecting if you chose a light or dark background color. Fixed issues with small thumbnails in post lists and archives after previous update. -- After making this update, although it is not required in all cases, it's suggested that you re-generate your thumbnails. Adjusted header social icons so they open in a new window if they aren't the email icon. Fixed responsiveness of header logo and social icons for mobile devices. Fixed shortcode generator not inserting [icon_link] properly. Adjusted styling on shortcode generator. Added TBTHEMENAME constant for internal processes. Improved overall localization for upcoming "Theme Blvd WPML Bridge" plugin. Frontend text strings now have a separate gettext domain. Added frontend theme location support and styling for upcoming "Theme Blvd WPML Bridge" plugin. Responsive CSS fixes to allow images to be re-sized in Visual editor, but still remain responsive. Fixed issues with conflicting native WordPress thumbnail sizes -- small, medium, and large. Fixed mobile select menu primary navigation to look consistent no matter what style options are selected. Updated to Theme Blvd Framework 2.1.0. Added many new styling theme options. -- Make sure to visit your theme options after updating. Tweaked theme design a bit with header and footer. Added option for text string under social icons in header. Improved drop down menus on mobile for \"graphic\" style menu. Added display options for post lists, archives, and post grids. Adjusted sidebar layouts to have less space in between columns and more space on content areas; this is most noticeable on double-sidebar layouts. Increased font size on mobile devices and tablets. Added option to switch main navigation into simple select menu on mobile devices. Adjusted slider design so if nav arrows and nav buttons are hidden, nav area will be hidden. Added basic print CSS styles. Adjusted some background images that were too light with Tan content color. Styled featured images of post grids to look nicer on wider mobile devices like iPhone landscape mode. Updated to Theme Blvd Framework 2.0.5. Adjusted Post List and Post Grid page templates so that the title will show according to option selected under Page Options. Removed most old IE transparency filters. I still do not claim the theme is fully compatible with IE7, but I did adjust the CSS so main navigation drop down menus will appear correctly on top of sliders in IE7. Added frames to images in [gallery]. Altered how theme adds image sizes so they can be filtered from plugin or child theme. Adjusted how viewport meta tag is set in head of the site depending on whether you have responsive design turned on or off. Integrated comments better into framework\\\'s internal front-end localization filter. Fixed YouTube filter to fix YouTube\\\'s wmode bug in their native embed code. Adjusted Changelog link on theme options page to open in lightbox popup. Fixed Picasa icon of social icon selections. Added \\\"themeblvdfootercopyright\\\" filter to footer copyright text option output for use in plugins. Added \\\"themeblvdpostthumbnail\\\" filter for use in plugins. Now allowing input of 1 column in [post_grid] shortcode. Adjusted recent tweet element to use caching. Added iframe as accepted HTML tag in content areas of the framework. Fixed bug with Featured area of custom layouts showing on Homepage with no featured elements. In generating [icon] shortcode from TinyMCE shortcode generator, fixed mug icon and added additional icons. Now toggle shortcode accepts shortcodes within along with WordPress automatic formatting. Fixed initial bug with \\\\\\\"Theme Blvd Simple Contact\\\\\\\" widget where the field titled \\\\\\\"Link #5 URL\\\\\\\" was not saving properly. 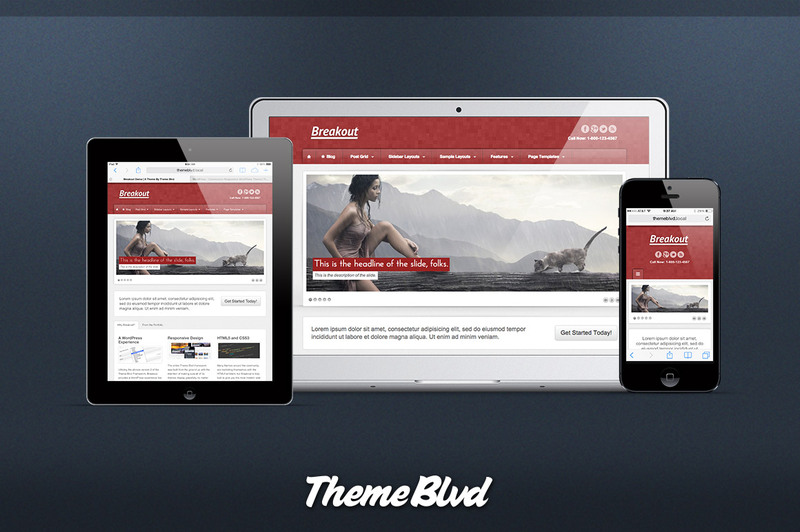 Updated to Theme Blvd Framework 2.0.4. Now when you turn off responsive design in your Theme Options, your site will have a fixed 960px width across all devices. Edited some descriptions on Theme Options page to try and avoid confusion with some options. Fixed bug with Slider Builder and needing text in \\\\\\\\\\\\\\\"Link URL\\\\\\\\\\\\\\\" field when hitting \\\\\\\\\\\\\\\"Insert into Slider\\\\\\\\\\\\\\\" button. Added Lucida Sans to selectable web font in Theme Options. Added new widget - \\\\\\\\\\\\\\\"Theme Blvd Simple Contact\\\\\\\\\\\\\\\"
On post list/post grid short code generator, link=true/false will now be inserted properly. Compressed some CSS files in admin panel. Improved caching with Twitter widget to avoid the error message that kept coming up, \\\\\\\\\\\\\\\"No public Tweets.\\\\\\\\\\\\\\\"
Fixed breadcrumbs options not working correctly on archives, 404, and search results pages. Added first-element/last-element CSS classes to elements in custom layouts. Added additional CSS classes to standard slider effected by options user selects. Adjusted output of custom images you setup with rel=\\\\\\\\\\\\\\\"themeblvd_lightbox\\\\\\\\\\\\\\\" so they aren\\\\\\\\\\\\\\\'t directly effected in the same way featured images are. Edited some wording of option descriptions for clarity under Post Options and Page Options meta boxes. Under Appearance > Theme Options you can now see the current theme version, framework version, and a link to the latest update log. Added several actions and filters for developers throughout different items of the framework.